The Black Mountain Center for the Arts (225 W. State Street) has a lot going on this weekend! Friday-Sunday, June 19-21 — The Art in Bloom Regional Gallery Show will take place at the Center along with floral interpretations in the gallery and upper floor. The artwork in the gallery, which is on loan from regional galleries, will be complemented by interpretations of flowers by area floral designers. The fragility of the flowers dictates that the show will only last a few days. 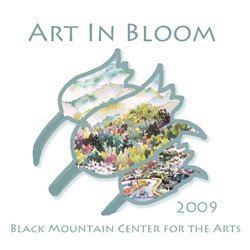 For more information or to purchase tickets, call 828.669.0930, or look at their website at www.blackmountainarts.org, and click on Events, then Art in Bloom. Admission is included in any event ticket below, or admission to the show alone is $5. Friday, June 19 — The Center will hold an Ikebana Demonstration and Afternoon Tea at 2pm. Watch Emiko Nishiwaki demonstrate the art of Japanese floral design with commentary by Terri Ellis Todd, while you enjoy afternoon tea and refreshments served on pottery tea sets made by studio potters (the tea sets will also be for sale.) Tickets are $25. Saturday, June 20 — You can catch an informative presentation by Master Gardener teacher, author, and photographer, Pam Beck of Raleigh. The presentation, Best Garden Plants for NC, will be at 2pm, and Black Mountain Books will provide books for a book signing by Beck after the presentation ($16.95). Tickets are $20 for this event. Friday, June 19 and Saturday, June 20, from 10am-4pm – The Center hosts a Garden Tour of seven local gardens, including Center for the Arts board member, Emily Ferguson. Plein air painters will be on hand in each garden to capture the event. A 15% discount for lunch at five local restaurants will be included on the $15 ticket. Sunday, June 21 from 12pm-4pm – The plain air painters’ works will be displayed in the Main Floor of the Black Mountain Center for the Arts.